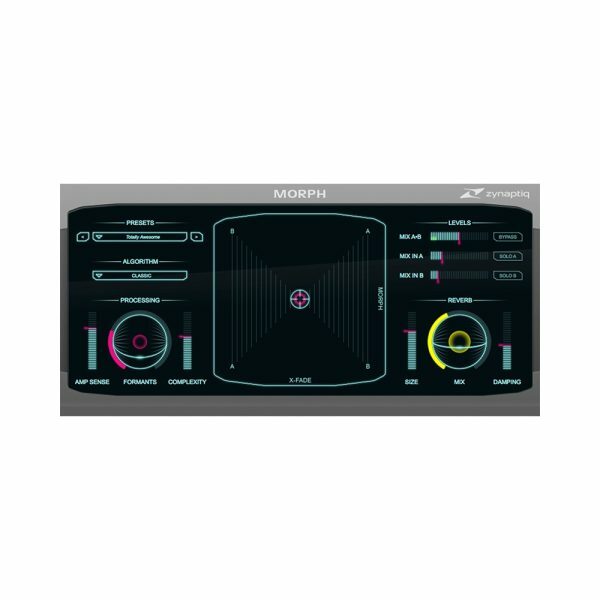 MORPH 2 è un plug-in in tempo reale per morphing audio strutturale, l’equivalente sonoro di un oggetto che cambia lentamente la sua forma per diventare un oggetto diverso, super-caricato con una selezione di 5 diversi algoritmi di morphing. MORPH 2 is a real-time plug-in for structural audio morphing, the sonic equivalent of one object slowly changing its shape to become a different object – for example, one face becoming another. Super-charged with a selection of 5 different morphing algorithms, a stunningly clean formant shifter as well as a lush reverb that seems to extend sounds much like some highly revered vintage hardware boxes, MORPH 2 opens up a whole new universe of sounds to explore. Create seamless morphing transitions, new hybrid sounds that combine aspects of existing ones, physically impossible instruments, the furthest-out creature and robot voices, talkbox-esque effects and other outrageously unique new sounds. Whether you’re a sound designer for film or games looking for that signature sound, or a music producer or remix artist wanting to create new content from existing recordings…look no further, MORPH is for you! MORPH 2 comes as two binaries, MORPH and MORPH SC (side-chain), to accommodate for the particluarities of the various plugin formats.